Welcome to Reanimation's 2004 Retro Remakes competition entry, a remake of Electralyte's 1992 Atari ST puzzle game, Balls. It was essentially written in about two weeks, one at either end of the three month competition period (July 1st - September 30th, 2004), although I did occasionally think about it during the intervening two and a half months. 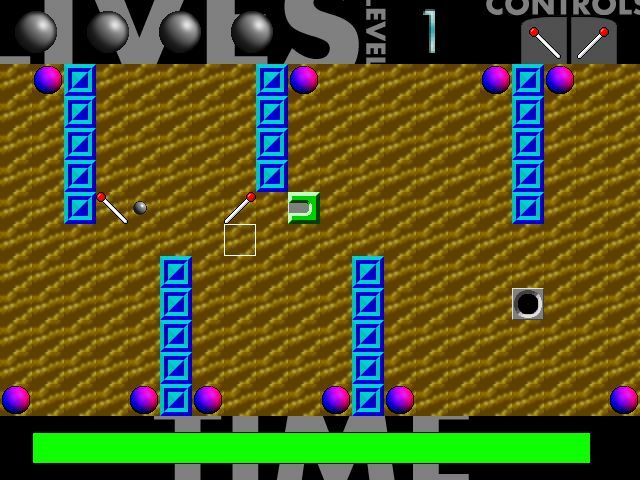 The original is another fairly obscure game that I remember enjoying at the time. So obscure, in fact, that I had to fire up my own ST and copy it over to the PC myself. (It is on one of the Automation disks, I believe, but presumably compressed, which would have prevented me using the level data.) 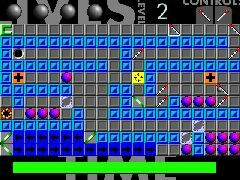 The original was a shareware game distributed on the cover disk of issue 86 of ST Format magazine. It was written in STOS, and the source was provided to registered users, which would have been a huge help had I registered. 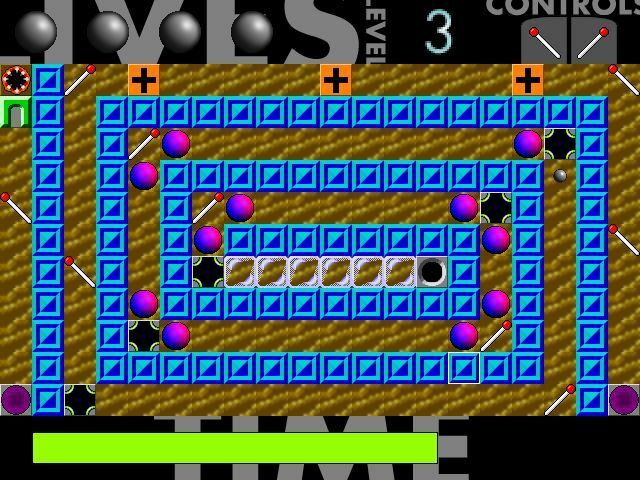 As with last year's entry, I used Game Maker 5 to create the game, and will probably make the source available in the near future. This was the first time I had attempted to build levels dynamically from a data file in GM, and it worked out quite well. Music. The original has no music, but I had intended to add a tune to the title page. The sequencer package I used last year, though, decided to fall out with my ctl3d32.dll for no particular reason and I couldn't get it to run at all. Those of you that heard last year's entry might not be too upset about that. Drop shadows. The original had nice drop shadows which helped show the height of the walls. I decided I didn't really have the time to get that working properly, and so chose to leave it out, but I do think it would make the game look nicer. More levels. I added the ability to load other level sets, so it would be nice to provide one. STOP PRESS: The results are in, and Balls Too was placed 18th of the 73 entries. I'm quite pleased with that, and it shows a nice improvement over last year's 29th place. 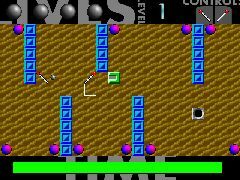 balls.zip (1.6Mb) - The game executable (zipped). v1.1 - 2004-11-30 - The sponsor screen can now be skipped, and the settings are saved between runs. 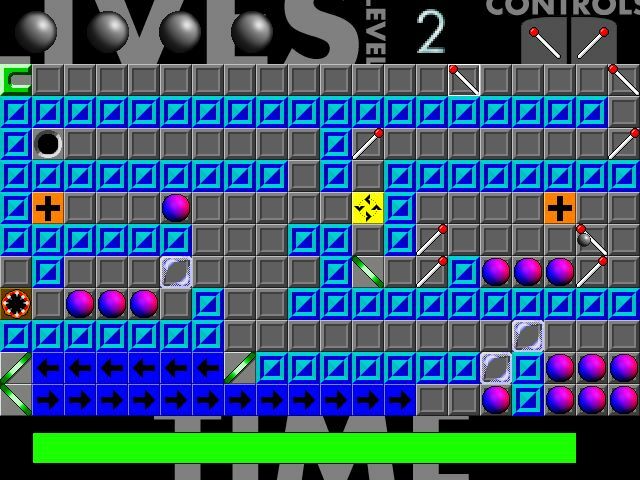 v1.0 - 2004-09-28 - As entered into the Retro Remakes competition. Last Updated: 1st December 2004.